Pushmeans to nourish and karameans who does or what causes. Pushkara is a special energy that nourishes. The term pushkara is used in connection to purification of the sacred rivers of India and the correct time to bathe in them so that all the sins of past lives can be washed of. While the rivers are sacred all the time, there is special times when they are energised with divine energy and this is the time to bathe in them. There are twleve sacred rivers in India and they become energised once every twleve year. The knowledge of this time is essential in order to dip into the holy river at the correct time. Similarly in astrology, there are certain parts of the zodiac that are specially sanctified and becomes zones where we can be healed and the soul cleanses itself. These positions are known as Pushkara Bhagas and navamshas. Pushkara navamsha nourishes the quality of the planet placed within it. Pushkara navamshas are special navamshas that enhance the quality of the planet. Pushkara bhagas are special degrees, which bring good luck and auspicious energy to the chart. Push means to nourish and kara means who does or what causes. So pushkara navamsha nourishes the quality of the planet placed within it. This can take the quality of the planet from ordinary to extra-ordinary. Pushkara are not given in many texts. They form the secret part of Vedic astrology in which when you dig deep, you come up with gems of analysis. The secret part was essential to give serious astrologers insight where the amateurs could fail. Chandra Kala Nadi, Jataka Parijata have a few shlokas that mention them. Their importance is understood through understanding the myth of pushkara and its relationship with the creator Brahma and Brihaspati (Jupiter). After a prolonged penance a Brahmin called Tundila was granted a boon that he would remain permanently with Shiva in form of Jalamayatva Siddhi. Shiva has eight forms and one of them is Jalamayatva Siddhi, the ability to live in water. Tundila became known as Pushkara, the one who nourishes the world as this penance gave him the power to purify all the holy rivers for the benefit for all. Brahma wanted water for creation and Pushkara?s ability to purify it. He pleaded with Shiva to allow Pushkara to live in his kamandal (the water pot that Brahma keeps by his side). Shiv granted this request. Brihaspati (Jupiter) asked Brahma that Pushkara should be with him, as water was essential for mankind and Pushkara?s ability to purify unique. Pushkara refused, as he did not want to leave Brahma. Brahma resolved the situation by asking Pushkara to stay with Brihaspati for 12 days when the latter was entering a new Rashi and 12 days when he was leaving it. On a daily basis, Pushkara would stay with Brihaspati for a length of two Muhurta (48 minutes is one muhurta) in the afternoon. Brahma, accompanied by all the other gods, would go with Pushkara to the holy river being blessed. Thus, Pushkara could be with Brahma as well as with Brihaspati at the same time. Brihaspati stays in one rashi for a year and takes 12 years to complete one cycle of the Zodiac. When Brihaspati comes into a Rashi then the Pushkara would be with him in the first 12 days (Aadi Pushkara) and the last 12 days (Antya Pushkara) as Brihaspati exits the rashi. When people bathe in a holy river at the time of Pushkaram, they take the blessings of Jupiter into the next twelve-year cycle of Brihaspati. 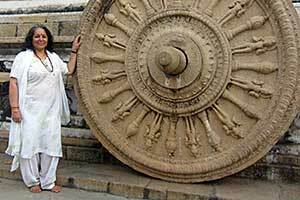 The twelve main rivers were blessed by Pushkara and purified once every twelve years. Pushkaram signifies the entry of Pushkara into the river water along with all gods and goddesses, which makes the water of that river pure for another 12 years. The entire year is considered holy to have the dip because earthly one-year amounts to only one divine day. During Pushkaram, the old sins can be washed away and the souls leave the water purified. People also pay homage to their departed ancestors during this time as well. All can experience the blessings of Pushkara twice a day when the pushkara muhurta is on by taking a dip the holy waters. The temple town of Pushkar in Rajasthan is blessed, as its lake is the living kamandal of Brahma. There is a rare Brahma temple there as well. This is one of the holiest place and people throng there to find absolution for negative past karma. Daily there are two Pushkaram when the holy waters get energized with the godly presence and these are the special times to take a dip in the holy waters as they are specially energized and purified. All the gods are residing with Brahma to give their blessing to the aspirants. There are twelve holy rivers in ancient India and these rivers are not always easy to trace in the present times. There are two pushkara bhagas/navamshas in each sign. This reflects the fact that there are two Pushkara muhurta daily in the afternoon. Two degrees became highly beneficial during each month. A muhurta is 48 minutes, the start of the muhurta would represent the Bhaga/degree as duration of it the navamsha. The navamsha and the bhaga do not always coincide. I do not have any answers for it as yet. How the exact daily calculation is done, I am still not aware of but will keep on researching and keep you all posted. In all these would make 24 positions within the solar year (360º Zodiac). These positions have been transposed into the natal chart to show degrees or navamshas, which become special placement for the planets. The planets in these positions take a virtual dip in the holy waters and regardless of their previous karma or weaknesses they have the ability to get redeemed and be strengthened. While humans can get rid of their sins by taking a dip in the holy waters during Pushkaram, the planets in the natal chart gets similarly blessed and lose all their negative qualities. What is important to remember is that the individuals in whose chart where the lagna or planets in the pushkara navamshas and bhagas should want to make the changes, to find the blessings. Otherwise these positions can just remain unrealized blessings. Brihaspati (Jupiter) has a special relationship with Pushkara and its position in Pushkara is especially beneficial. The rishis and spiritualist wait for pushkara time to rise before they take a dip in the holy waters, similarly we can get the same blessings by choosing a pushkara lagna rising in our muhurta.